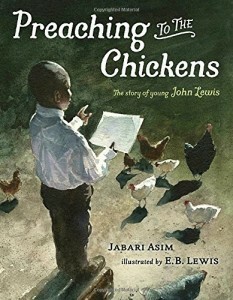 In this exquisitely illustrated children’s book, the biography of John Lewis is offered as an inspiration to all of us. The story focuses on his early years as he worked the farm, and became inspired to preach. However, what makes this illustrated children’s book stand out is the rhythm of the language, the beauty of the illustrations, and the message that is offered over and again. We see for ourselves how the values that John Lewis grew up with as a child deeply created the iconic figure that he is today. Becoming a beacon for non-violent resistance is no small feat in a world prone to aggression. Yet even at an early age, John understood the higher path. As we see in this illustrated children’s book, he didn’t even want his dear chickens to suffer. I can imagine reading this with a young child and reveling in the images, bringing us back in time to a farm, and an innocence that eventually had to stand up to the light of reality. For a biography, I believe an illustrated children’s book is one of the best mediums to bring a person and history alive. While often images preclude our imagination, in this case, the images let us be with John on the farm, and see his life through his eyes. A beautiful offering to a beautiful man. For older children, check out the graphic novel trilogy, March.